Today’s cookbook of the month recipe is actually one you have already seen before. No I am not posting a recipe repeat… but you have seen this recipe before.. or at least pictures of this recipe before. You actually saw them last week and didn’t even know that those same fries that were pictured with the Southwestern Sloppy Joes were gunna be this week’s recipe. WOW! I should really pat myself on the back for knocking out two recipes in one photo opt. Which allowed me to be ahead of schedule on my cookbook of the month recipes and was able to create this post last week and have everything ready for today and not be rushing till the last minute to make and blog today’s cookbook of the month recipe and have to stay up till midnight to do it all (wow that was one looonnnggg and windy sentence; my high school and college English teachers would be SOOO disappointed). Whoa… let me catch my breath for a moment and tell you about the fries. (A few minutes later) ahh that’s better- now onto the fries. Last week when I posted the Southwestern Sloppy Joes I talked about how I like creating/finding recipes that are spins on traditional foods/recipes. 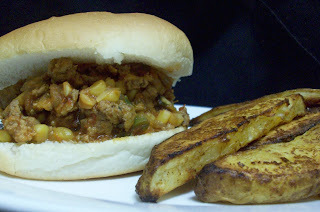 The Southwestern Sloppy Joes were a fun and tasty version of a childhood classic. Well the dilemma when you put a twist on a classic is always do you serve a classic side (like if you do a Mexican Lasagna do you still serve french bread with it or do you serve black beans and corn)? Well what goes better with a Sloppy Joe (no matter what version) than fries. And the best thing about these fries is that they are seasoned with spices that are found traditionally in Southwestern Cooking; like cumin and cayenne powder. These fries were perfect with the Southwestern Sloppy Joe, were easy to make, and cost literally just pennies. How can it get any better than that? Preheat the oven to 450 degrees. Lightly spry a baking sheet with nonstick cooking spray. Combine potatoe wedges and olive oil in a bowl. Combine all spices in another bowl. Sprinkle the spice mixture over the potatoes and toss well. Arrange potatoes in a single layer on the pan. Bake 20 minutes, then turn the potatoes, and bake until crisp and cooked through, 8-10 minutes longer.